Furniture – Tables, Chairs, etc. RDM Industrial Products, Inc. has been manufacturing Industrial and Laboratory Furniture since 1977. We strive to provide Top Quality Products and Service to all of our clients, both old and new, On-Time and On-Budget.
. . . A N D M U C H M O R E . . .
Our commitment to you is to deliver the best quality products that withstand the most aggressive industrial environments with top quality service in a timely manner. As Lab Furniture Manufacturers, we have complete control over many of the products we offer, which simplifies any expedite services that may be needed. When we say Manufacturer-Direct, we truly mean that our manufactured products are produced under our roof – We do not disconnect ourselves with separate facilities for sales and management teams. 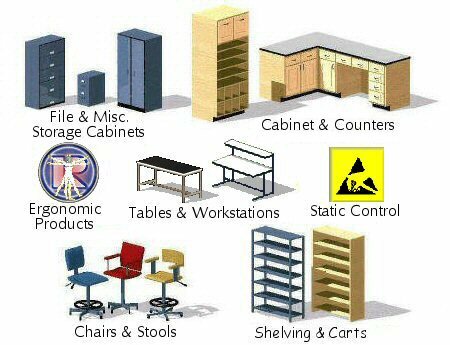 As a Reseller / Distributor, we offer many peripheral and support products, to compliment the industrial and laboratory furniture we produce, such as chairs / seating, storage solutions, carts, shelving, and ESD static control products. The vendors for our distributed products are carefully selected to ensure that they also provide the same service, quality and value that our clients have come to expect from us. RDM Industrial Products is renowned for being the preeminent supplier and manufacturer of industrial laboratory furniture, carts, storage cabinets and more. Thanks to our top notch customer service and high quality products, we have gained the reputation of being the place to go to when you need industrial furniture and fixtures. We work with businesses in an assortment of industries to provide them the products they need to improve functionality, organization and convenience at their workplace. Among the different products in our inventory are ESD static control products, stainless steel storage carts and laboratory tables. Advantageously, we can customize many of our items to suit the specific needs of your business. Visit our category pages to see images and specific product information. If you are unsure of what type of industrial furniture your business needs, you can always contact or live chat us and one of our exerts will provide you with guidance you need. Thank you for choosing RDM Industrial Products!